Click here to read Part One of the article. This post continues The Norse Mythology Blog's photo-essay on the J.R.R. Tolkien archives at Wheaton College's Marion E. Wade Center. Tolkien is not the only author that the Wade Center focuses on, and the essay concludes with some wonderful items connected to C.S. Lewis. The author of The Chronicles of Narnia was a longtime friend and colleague of Tolkien, and both writers were members of the informal literary discussion group known as the Inklings. The glass-fronted bookcases of the cozy and welcoming reading room include a great number of works by and about Tolkien in several languages. 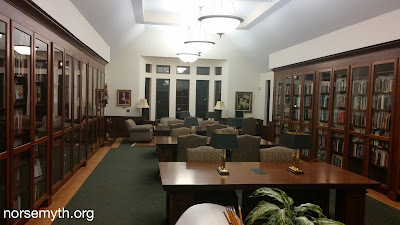 The archives and library of the Wade Center are non-circulating, but they are available for use in the reading room (smoking of pipes not allowed). 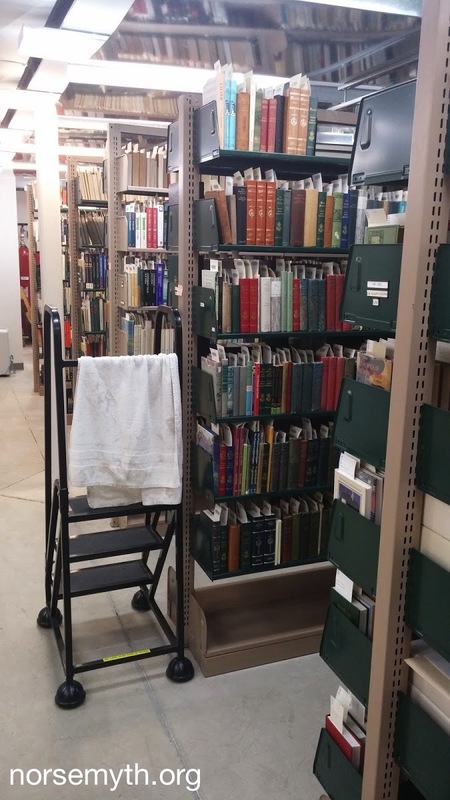 You can search the Wade Center's holdings by clicking here, and you can see a list of books, magazines and pamphlets now in the collection that were originally owned by Tolkien himself (many with his personal library bookplate) by clicking here. 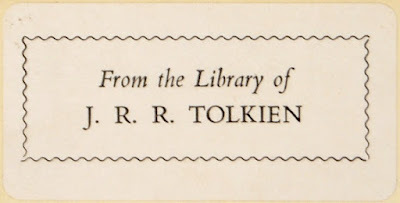 Update (July 24): A detail-oriented member of the Tolkien Society has pointed out that the "personal bookplates" were added by a later bookseller, not placed by Tolkien himself. 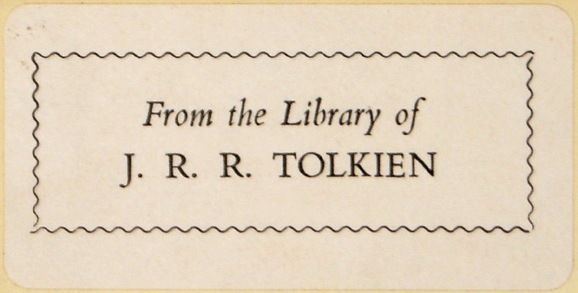 To be clear, the books were actually owned by Tolkien; the labels were simply added after they left his possession. 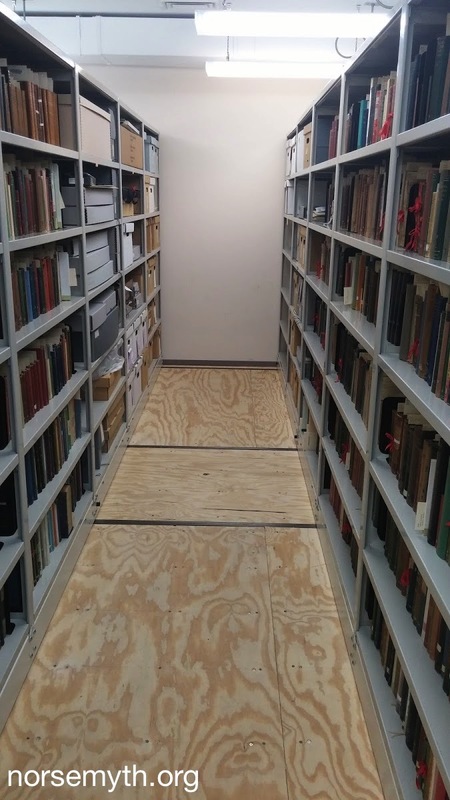 Directly off the reading room is a small annex that houses a variety of materials. In the bookcases on the left are journals relating to the Wade Center's featured authors; on the right are dissertations relating to them. You can read about the Wade Center's own journal, VII: An Anglo-American Literary Review, by clicking here. On the far wall are oral history transcripts and original letters by the authors, including serveral by Tolkien. The file cabinets contain articles, including a print version of my own piece on Éowyn, "Tolkien's Heathen Feminist." The bulk of the Wade Center collection can be found in the basement stacks. 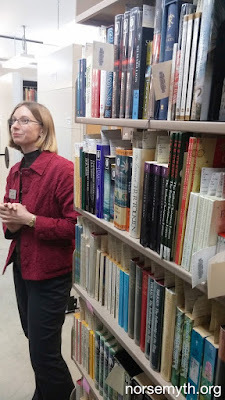 The mechanical movable bookshelves pictured here are packed with works by and about all seven of the featured authors. There's enough here to make any Tolkien fan weep with want. Every edition of every Tolkien work, maps, board games, magazines, toys... It's pretty amazing. Wade Center archivist and Wheaton College Tolkien Society staff advisor Laura Schmidt was kind enough to give me a guided tour of the entire Wade Center. Here, she explains something fascinating about the collection in an erudite and sophisticated manner while I distractedly drool over deluxe editions of The Hobbit. So you think you have an impressive Tolkien collection? 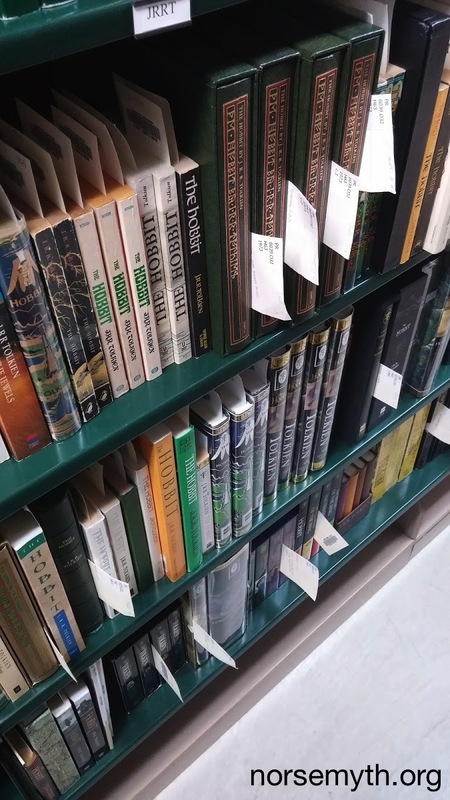 These are just some of the editions of The Hobbit held by the Wade Center. I may have left teeth marks on the green boxed edition with the gold dwarvish runes on the spine. Sorry. Back upstairs in the main display room sits the work table of C.S. Lewis, used in his rooms at Magdalen College. It later served as the dining room table at The Kilns, his home outside Oxford. 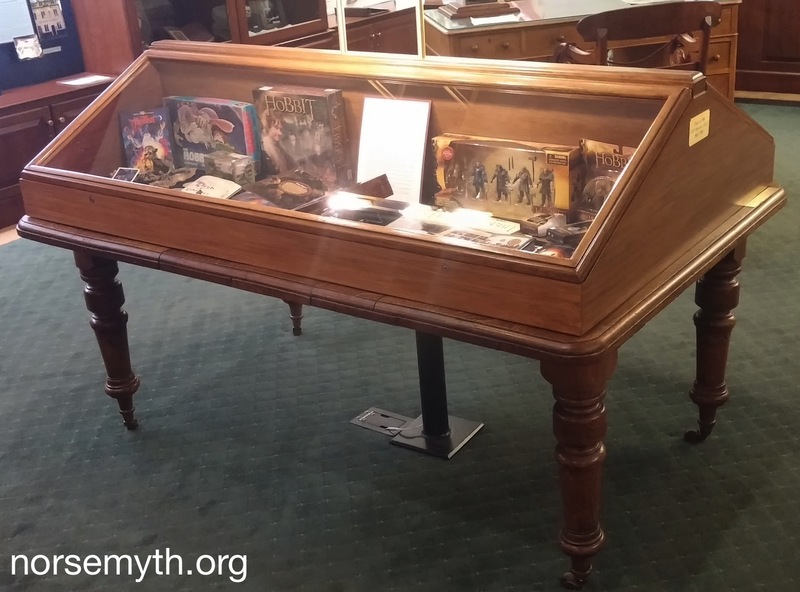 Purchased for the Wade Center in 1974, it now houses a collection of memorabilia related to The Hobbit, including a DVD of the 1977 Rankin/Bass cartoon (my own introduction to Tolkien when it first aired on television) and various games and toys. Maybe there's a rivalry between Middle-earth fans and Narnia fans, like there is (or used to be) between Star Trek fans and Star Wars fans. I'm not sure. 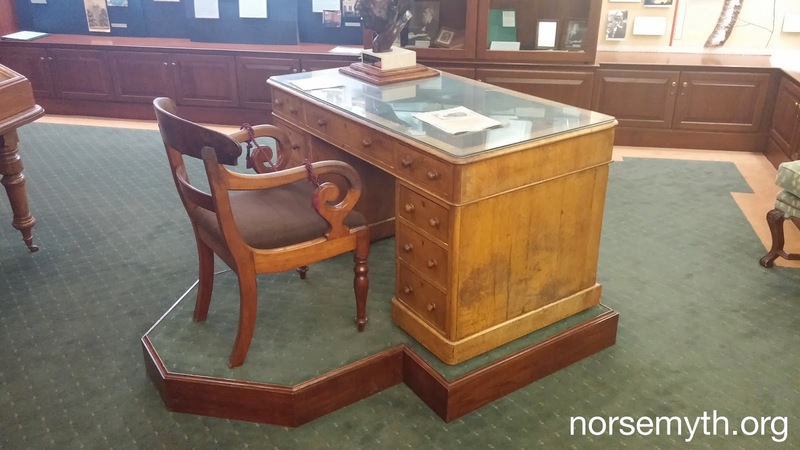 I grew up loving all four mythologies, so I was also interested to see the desk and chair from Ireland, used by Lewis at Magdalen College and then at his home at The Kilns. It's a bit strange to stand in a room with the writing desks of both Tolkien and Lewis! If you grew up with The Lion, the Witch and the Wardrobe, as I did, you'll understand why it was so wonderful to see this. Adzed, assembled and carved from oak by Lewis's grandfather with handmade hinges and nails, it stood at Little Lea, Lewis's home as a boy in Belfast. It was later moved to the main hallway at The Kilns near Oxford. 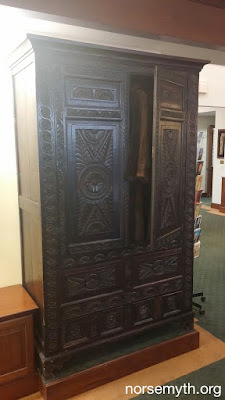 Lewis's brother stated that this wardrobe was the inspiration for the one that served as an entrance to Narnia in The Lion, the Witch and the Wardrobe. With Laura's permission, I pushed the coats aside and felt the back of the wardrobe. It was solid wood. Sometimes the magic works, sometimes it doesn't. 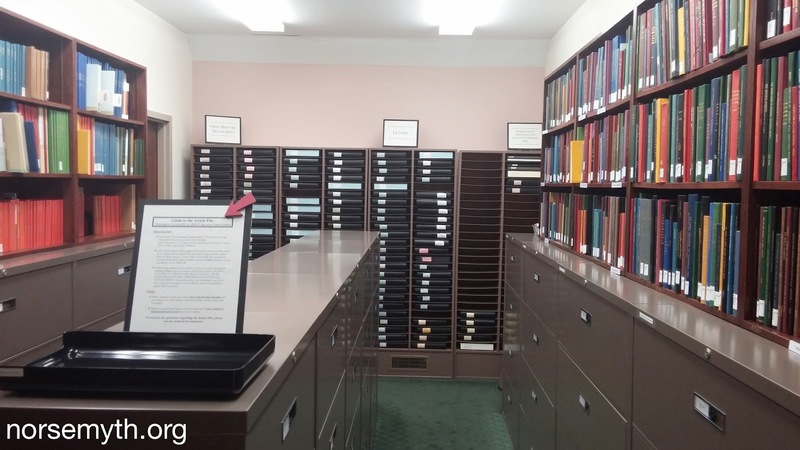 Information on the Marion E. Wade Center was kindly provided by archivist Laura Schmidt. Details on objects in the main room are taken from explanatory materials in the center. Thank you to Laura and the Wade Center staff for all their help! My new public classes on The Silmarillion start in September. 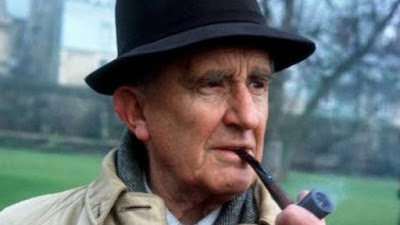 Students will read Tolkien's brilliant epic of the early ages of Middle-earth and learn about the work's roots in Norse, Celtic and Finnish mythology. Registration details will be posted on the Norse Mythology Classes page. Also, if you're on Facebook, be sure to follow the Tolkien Project!